Humor, kindness and moral courage, these are the things I cherish most about you. I so wish I could give my girls a just world, but I know you will make it a better place. 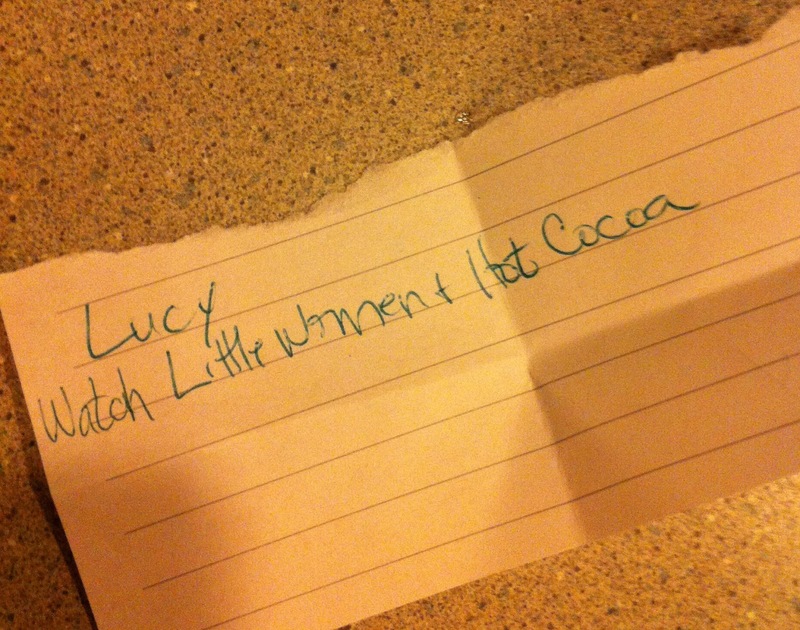 Every Christmas, we bust out some pretty sweet traditions. They aren't too fancy, but the kids seem happy. They make us all happy. I am big on traditions. Traditions are good, they are solid, safe and reassuring, and fun. Lucy and Peyton lighting the candles at our Sunday Advent dinners is a treat for them. 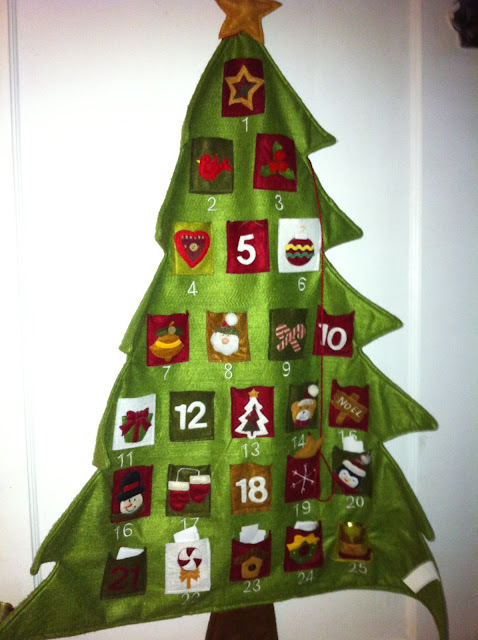 One of our traditions is an Advent Calendar, like a lot of people. But ours isn't filled with candy or gifts, it's filled with what the kids call "fortunes"--notes like in a fortune cookie. 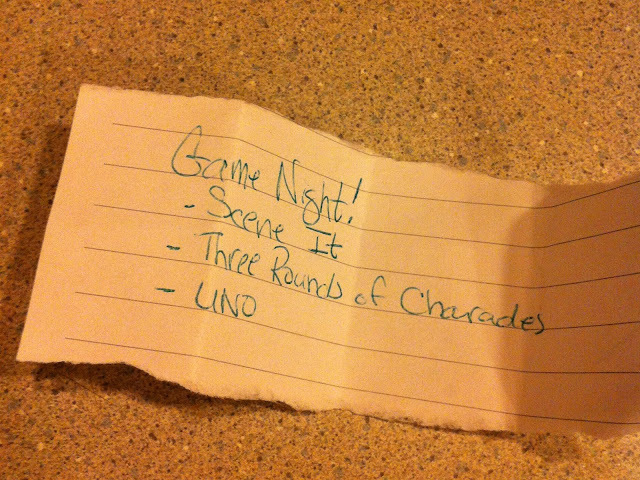 Each note has a special activity or event such as "Family Game Night" or "Stay Up An Hour Past Bedtime." We try to include as much one-on-one time with each child as possible in the "fortunes," because let's face it one-on-one time is pretty much a Christmas miracle in this busy, hectic household. "I know my time with mom will be shopping," Lucy announced one day before reaching into the calendar pocket. I asked her why she thought that and she replied "because that's what moms and daughters do, shop." I almost spit out my drink. You see, I'm not a shopper. My kids have only been to a mall a handful of times and they act like it's a museum, all strange and new and fascinating. There's nothing wrong with shopping, but I simply don't want my only daughter to think that's the only way we can bond. I don't want shopping to be our core commonality, our identity as female reps in this house where testosterone reigns. One of our other special traditions during the holidays is watching movies. 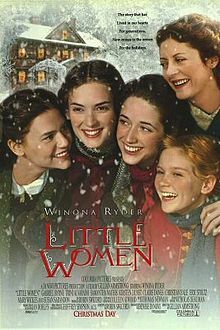 When my daughter Lucy was little she would snuggle on the couch with me and watch one of my holiday favorites, Little Women. The 1994 Susan Sarandon/Winona Ryder version. Of course, many years she would fall asleep next to me or spend part of the moving coloring or playing quietly. This year however she came to the couch to really watch. She had questions and was appalled that Jo wasn't going to college when Laurie did. We talked about how women couldn't vote or own property. We talked about the clothes they had to wear in the 1860s and how they had to sometimes hide their true personality in front of boys and men and society...how they had to be proper ladies. Winona Ryder as Jo reminded me of my little Lucy, crinkling her nose, stomping her feet, loving large and fighting big. Susan Sarandon's take on the character of Mrs. March, or Marmee as her daughters call her, was nothing short of inspiration. A feminist/political power with tenderness and love who had some really great quotes. I found myself nodding saying "preach Marmee, preach." Go, and embrace your liberty. And see what wonderful things come of it. Halfway during the movie my boys wandered into the room and reluctantly sat down and started watching the movie. In true Jo fashion, Lucy crinkled her nose and said, "What are the boys doing here?" But she quickly forgot being annoyed when Beth got sick. Worried about Beth, everyone became invested in the movie. Little Women wasn't just a mother/daughter movie, but a whole family movie. Even my husband sat down and was surprised by the actor who plays Laurie. "Is that Batman?" he asked. Yup, that's Christian Bale. The whole family watched--we enjoyed a movie about women and identity; we discussed history, including how lucky we are to live in a time with good medicine and no Civil War and more equal rights. Turns out, I not only want my daughter to know that women do more than shop, I want my sons to know that too. The movie was about a family holding onto each other, and their ideals, loving each other in an uncertain time. Um, yeah, I can relate. And that's what makes it timeless and a definite holiday classic. What holiday movies are on your must-watch list? This movie review was done for Mommy Bear Media where you can purchase Little Women and a slew of other family friendly movies. Take a look at Mommy Bear Media--they have a wide variety of older movies and the best new movies on DVD for the whole family. And they offer free 2-5 day shipping on all orders. In addition to their website, you can follow up with them on Facebook and Twitter as well.